Despite its name this is a relatively compact plastic shed, although it does have twice the depth of the little hut also offered by Duramax and therefore gives twice the storage space. 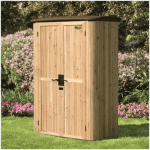 Its compact nature means that it’s ideal for smaller sized gardens, and we can even imagine it being used as a storage facility at a caravan park. The PVC cladding is not the thickest we’ve seen, but it is given added strength and stability by a strong steel frame. This means that it’s suitable for use in exposed areas, and it should also prove to be very durable which is one of the reasons that the manufacturer has been able to provide a reassuring 10 year warranty. Its also very water resistant, as both the wall cladding and the apex roof are very effective at repelling rainwater and channeling it away. It was good to see that an integral floor had been included, which isn’t something that we always see on plastic sheds, and we also welcomed the window free design as this can act as a useful deterrent against shed theft and break ins. If anything of particular value is going to be stored, however, a padlock will need to be added. This almost square based plastic shed offers a lot of advantages for the small to medium sized garden, and we found its appearance pleasing on the eye too. The ivory white PVC is very in vogue, and gives a stylishly contemporary look to a garden. It’s also very useful as well, of course, particularly as the fire retardant nature of PVC makes it suitable for the storage of flammable materials such as paint, varnish or petrol, or even machinery. The apex roof at the top of the shed is shallower than many we see, but is still quickly disperses rainwater. It also means that the headroom inside the shed isn’t restricted too much, as shown by the ridge height of 1.99m and the eaves height of 1.80m. The overall width of the shed is 1.73m and the overall depth is 1.78m, so the level area on which you place it will have to at least match those dimensions. If you’ve never had a shed with PVC cladding before than you’re missing out on a lot of benefits. Foremost among these are the facts that not only is it virtually fire proof it’s also rot and rust proof. Whilst we have seen thicker plastic cladding used on some of the sheds we’ve reviewed this still felt strong and stable once it had been assembled, and that’s largely to the use of a strong steel frame and supports. We were pleased to find that an integral floor had been included, as we often find that a bare concrete surface has to act as the floor. In this instance the floor is made of moulded plastic, and is therefore much tougher and thicker than the cladding itself. 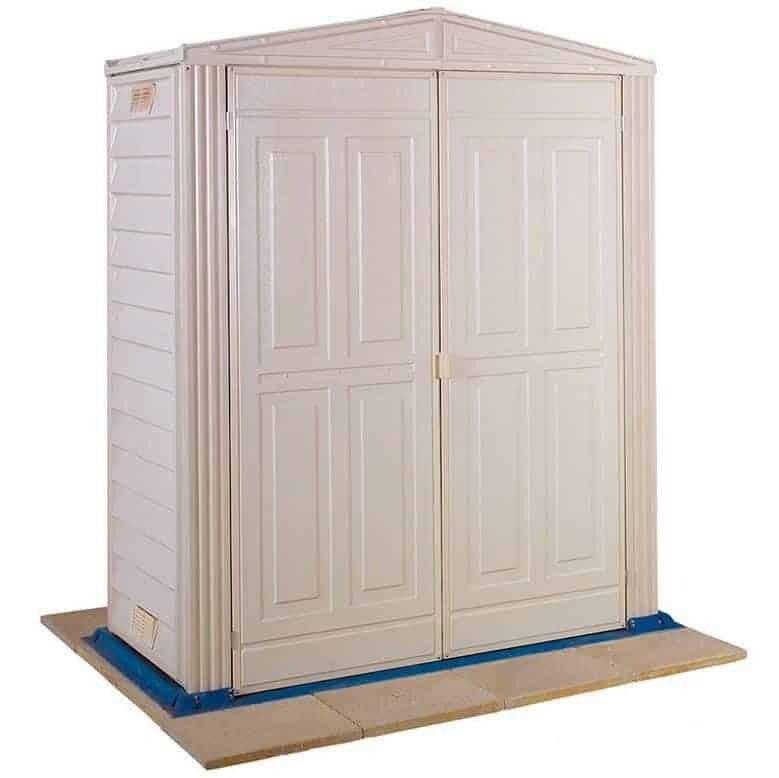 The manufacturer has provided a 10 year warranty with this shed, and whilst long extended warranties such as that are something that we always like to see, we feel that it could have been even more generous on this occasion. That’s because of the very durable nature of PVC cladding, and it’s also very weather resistant so the owner won’t have to worry about heavy rain or strong winds. One other thing they won’t have to worry about is having to add wood preserver on an annual basis, or having to paint the cladding. 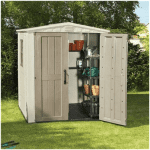 That makes it an ideal choice for people who want a trouble free shed for years to come. 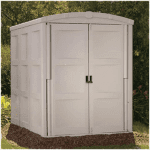 We were pleased to find that the double doors are some of the most accommodating that we’ve seen on a plastic shed with this kind of storage capacity. They have an opening width of 1.34m and an opening height of 1.78m, which comes in especially useful for people who are moving wide or tall items in and out. We also found that it means you can make the most of every inch of storage space that is available. Whilst there are no windows we were pleased to see that it did include vents. This means that fresh air circulates around the interior, which not only makes it a pleasant environment to spend time in it also helps to reduce the risk of condensation. Whilst windows are essential for larger sheds and workshops, we are always pleased to see window free designs for smaller storage sheds such as this. That’s because it means that the contents within are kept hidden from passers by, and therefore hidden from potential intruders. We would also like to have seen a padlock included, as although the doors are padlockable the lock itself is missing. For that reason, we would advise anyone buying this shed to find and buy a good quality padlock as well. There are four optional extras that can be purchased directly with a shed, one of which is a wheelbarrow which can be used to manoeuvre heavy items through the wide double doors. The optional extra that we think will be most useful, however, is a stand alone shelving unit. It measures 0.76 X 0.51m and features four resin topped shelves. This allows the owner to use more of the vertical space available as well as that which is at ground level. This PVC not only looks good, it features high quality components as well, from the moulded plastic floor to the apex roof. Whilst the cladding can seem quite thin at first, once fully assembled it forms a very strong and durable structure. 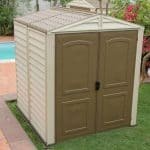 Even though this building has the word large in its name, it’s not one of the biggest plastic sheds we’ve reviewed. The tall eaves do however provide extra vertical storage space. 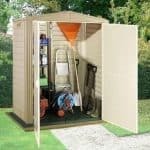 The manufacturer states that two people can assemble this shed in around four hours, but there are quite a lot of components to fit together so we would advise allowing up to twice as long for the process. 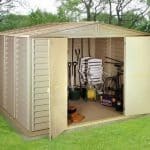 This is a durable shed that comes with everything needed, other than a padlock, but it does cost more than many similarly sized plastic sheds we’ve reviewed. 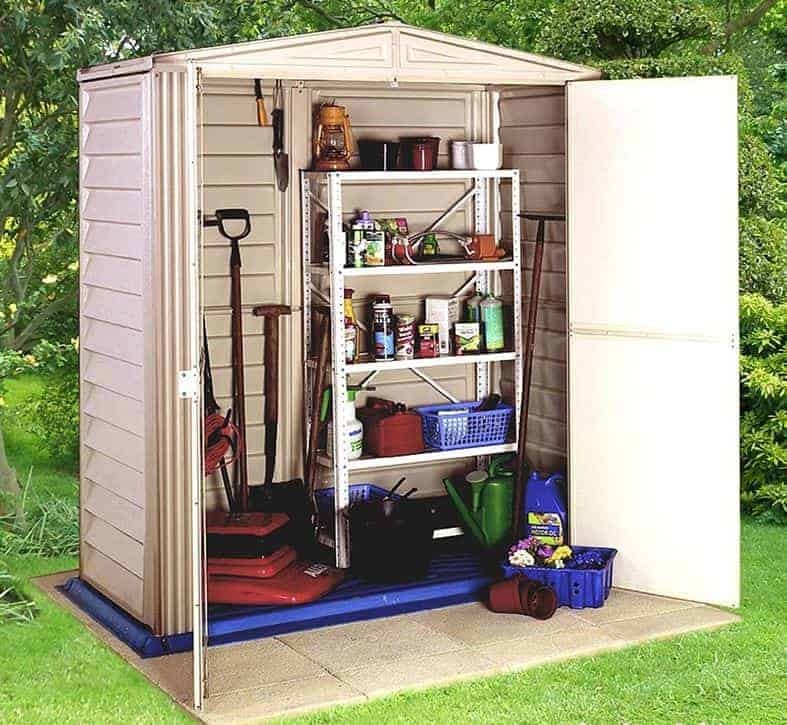 Final Thoughts: If you have a limited amount of space available in your garden, but still want a storage space for your garden tools or maybe even a bicycle or two, then this shed is well worth your consideration. It’s as deep as it is wide, and there’s lots of height as well, so you can store more inside than you might initially imagine. It also means that you won’t have to worry about bumping your head when walking around inside. We liked the inclusion of a floor, and this will be especially welcome during the winter months when a concrete base can soon create a cool interior. With the addition of a padlock this could also be used as a secure storage facility, thanks to the window free design.